The Summer of 2013 The Brits dominating the world sporting scene with wins in the Tour de France, The Lion's rugby tour, Wimbledon, AND the Ashes..... and glorious weather!! Can it last? Of course not, English sport will settle back to its usual disappointing form, and the weather is bound to change. The Brits dominating the world sporting scene with wins in the Tour de France, The Lion’s rugby tour, Wimbledon, AND the Ashes….. and glorious weather!! Can it last? Of course not, English sport will settle back to its usual disappointing form, and the weather is bound to change. But not in the summer of 2013…it could not have been better. 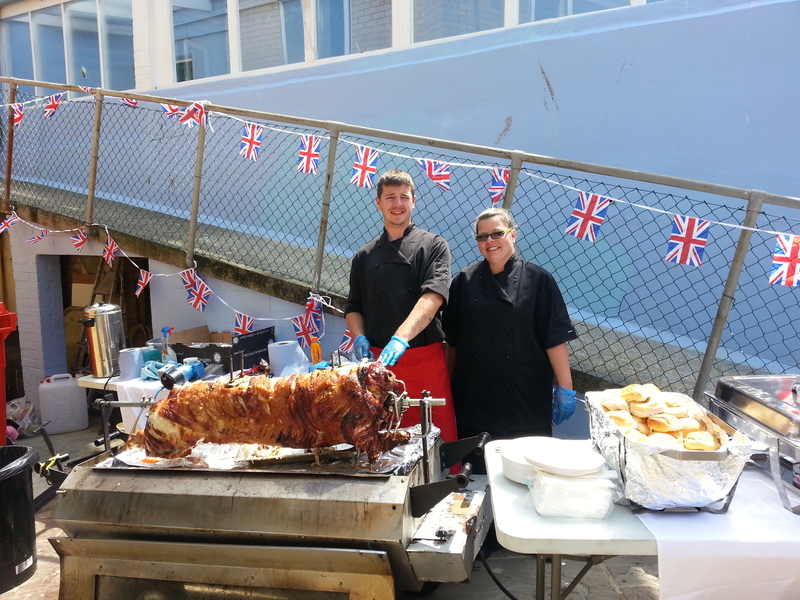 The British people were in a good mood, they had pulled themselves out of economic recession and the sun was shining. 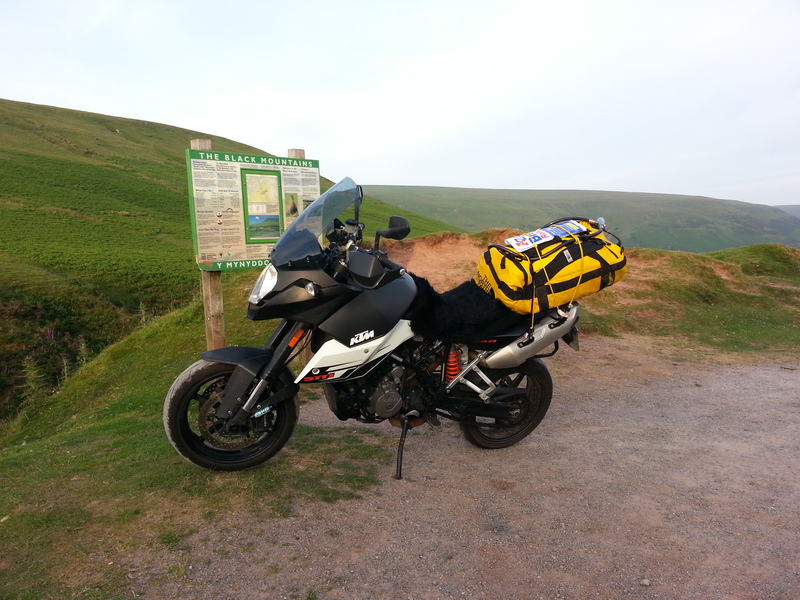 I rode three thousand miles across the UK and through as many of Britain’s beautiful national parks as I could on perhaps the best road bike I have ever ridden, the KTM 990 SMT. 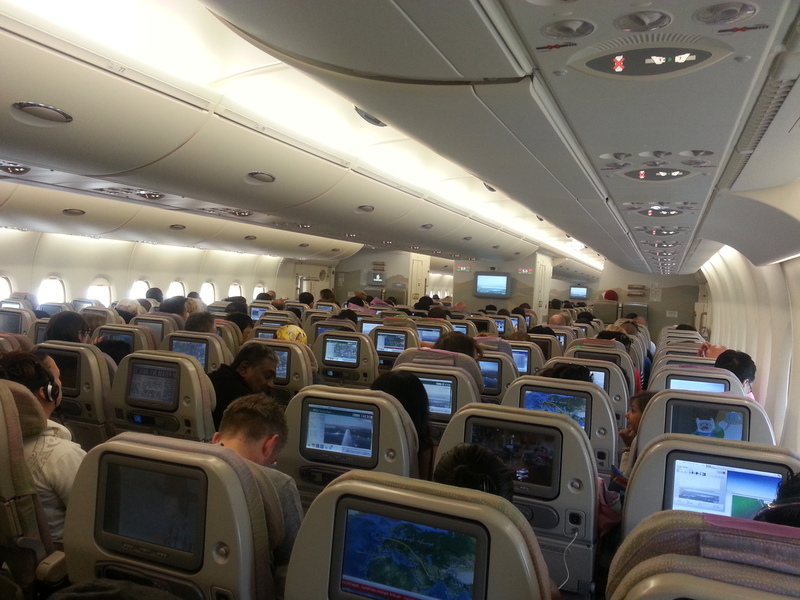 On the way back to the UK on the superb Emirates’ Airbus A380. Once I get to the UK I plan to buy a motorcycle. Renting a car is 20-40 pounds a day and to be honest I find driving cars extremely dull. Renting a motorcycle would be much more fun, but extremely expensive at more than 80 pounds a day. Public transport? Ridiculously expensive, unreliable and not very convenient outside the cities. Buying a motorcycle makes perfect sense, provided I can find a good one at a decent price. In actual fact, the overall cost is quite low and its the best way to explore the British Isles if the weather is good. 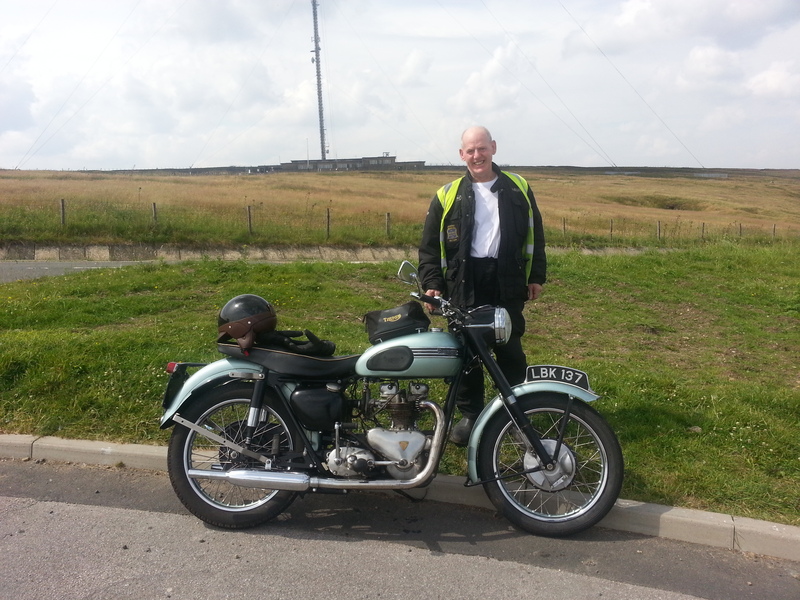 I have reached my half century and so motorcycle insurance is also very cheap and easy to arrange. The question is which motorcycle do I buy? 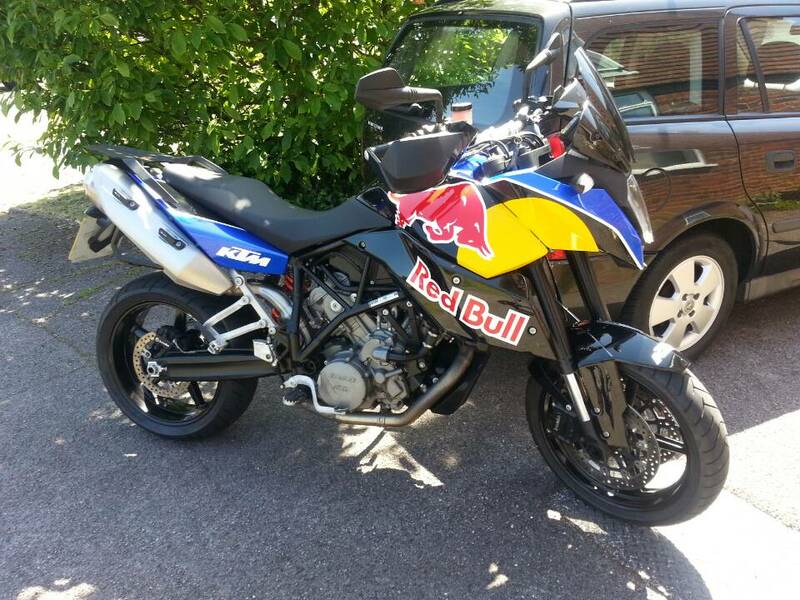 However, Fanny recommended I buy this KTM 990 SMT in Red Bull colours that I found on eBay. This bike shares the same DNA (V- twin 1000 cc LC 8 engine, WP suspension, Brembo brakes etc) as my KTM 990 Adventure R. The difference being KTM have customized it to roads and unlike the standard Supermoto, adapted it for long distant touring. On arrival at Heathrow I went straight to my bank to withdraw cash, and then to P&H Motorcycles in Crawley to buy this bike that I found on the internet before I left Hong Kong. 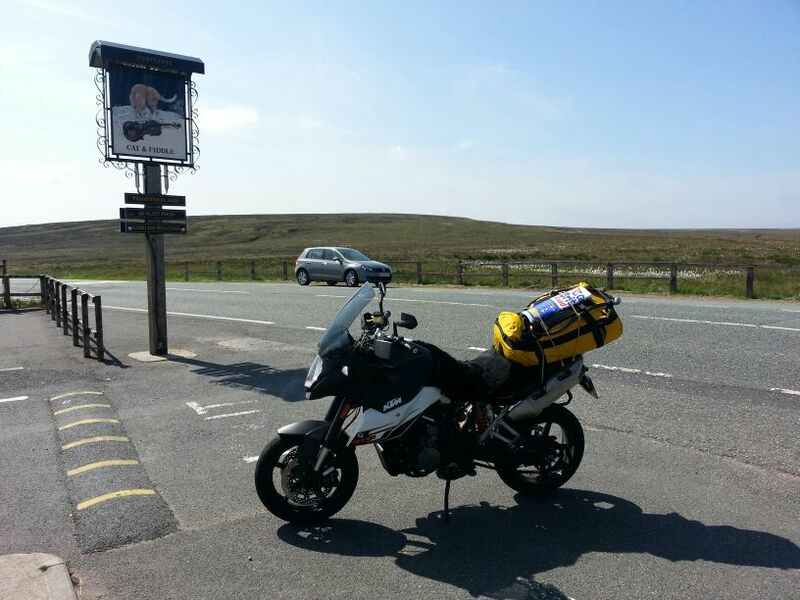 My friend Nick Dobson had already given the bike a test ride and general inspection and after agreeing a price I bought it on the spot, loaded my luggage on the back and then started off on a tour of the UK …. all within a few hours of arriving in the UK. It really is that easy. However after riding along the south coast of England and across Salisbury Plain to my sisters house near Stonehenge the bike suddenly stopped in the middle of nowhere and no amount of tinkering was able to get it going again. I suspected the fuel pump had gone… The very “bling” Red Bull paint job must have been hiding some “issues” in its four year history. Staring at a motorbike that didn’t want to start and chuntering to myself was not solving the problem and so I wheeled the bike to a nearby farm where a very kind farmer put it in one of his cow sheds for the night and gave me a lift to Salisbury where I found a pub, drowned my sorrows with a few beers, and called my sister and my niece to come and rescue me. 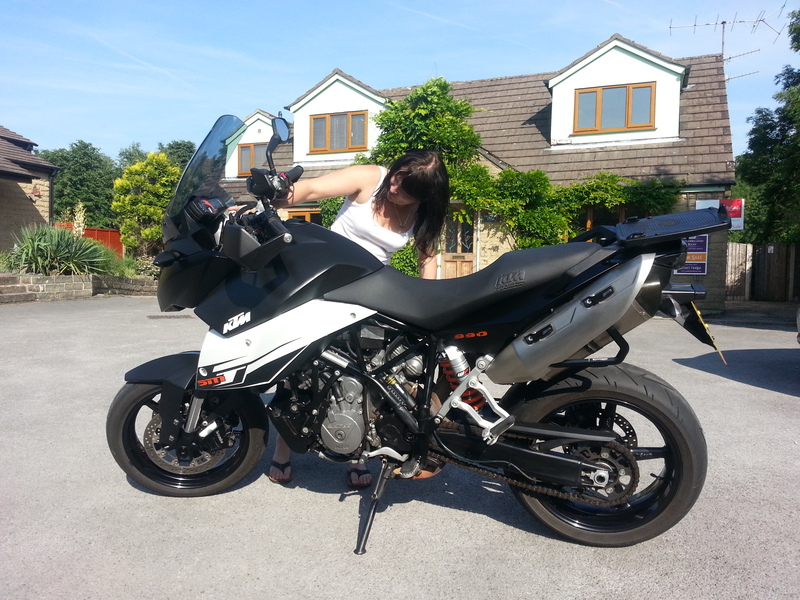 As I had just bought the bike the RAC vehicle recovery service on my insurance policy had not started yet. I could have pretended it broke down the next day, but dishonesty is not in my nature and so I would have to make another plan. 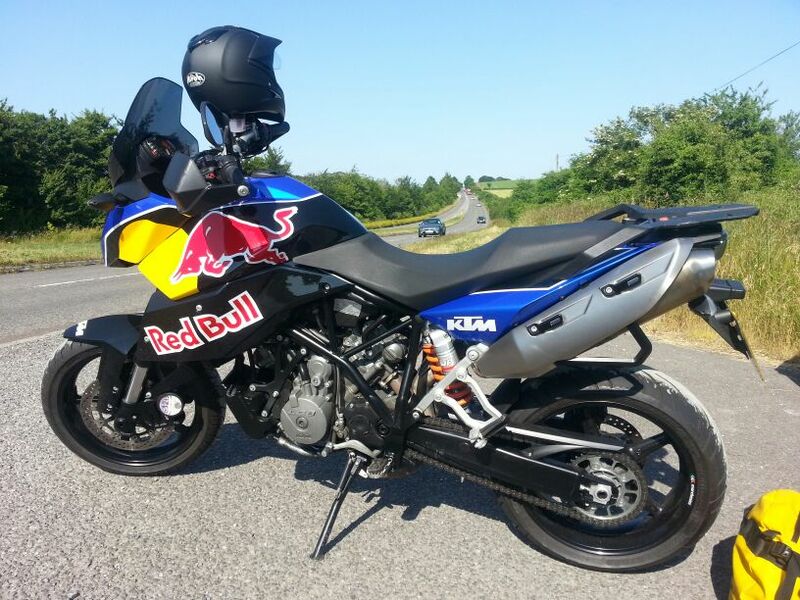 The Red Bull KTM outside Midwinter’s Farm on the A30… Fortunately the farmer was a top guy and was really helpful. A big “Thank you”. At the time it “stopped” I thought I was heading to my sisters house in Netheravon. In actual fact I was on the wrong road and heading towards London. No GPS and clearly no sense of direction. 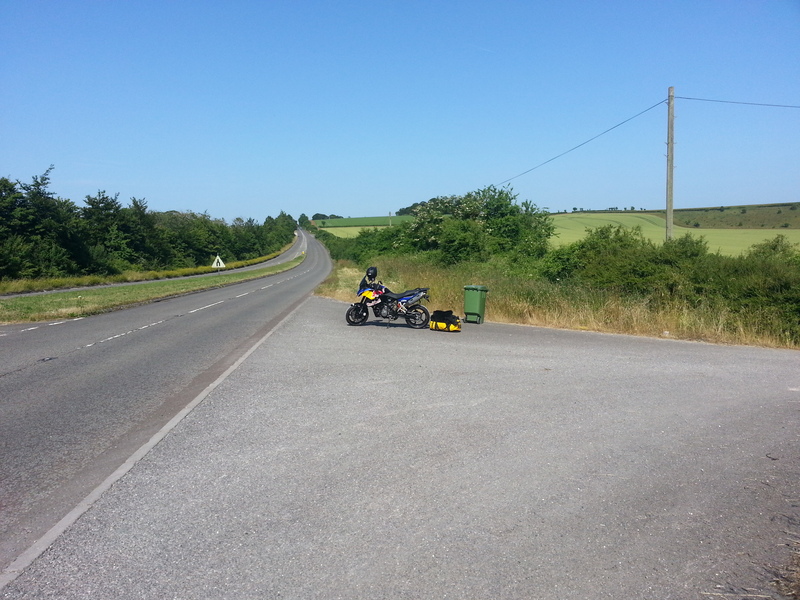 It was obvious that I had broken down by the side of the road but the other bikers, of which there were many that day, just whizzed by without stopping …. Having ridden around the world I can say this is not the attitude in other countries, where the general biking community always looks out for each other. In fact, all the way from South Africa to Turkey and even in China people always asked if we were OK whenever we stopped by the side of the road. 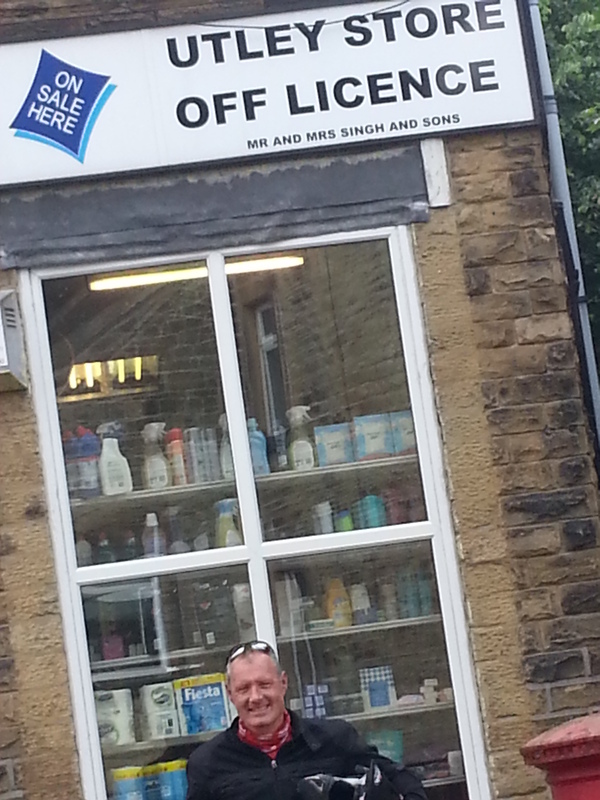 That said, I am pleased to say things got much more friendlier the further north I went on my UK trip. After being rescued by my sister and niece and getting fed and watered, I contacted P&H Motorcycles in Crawley and told them the bike that they had sold me earlier in the day had broken down and would not start and that I was stranded. 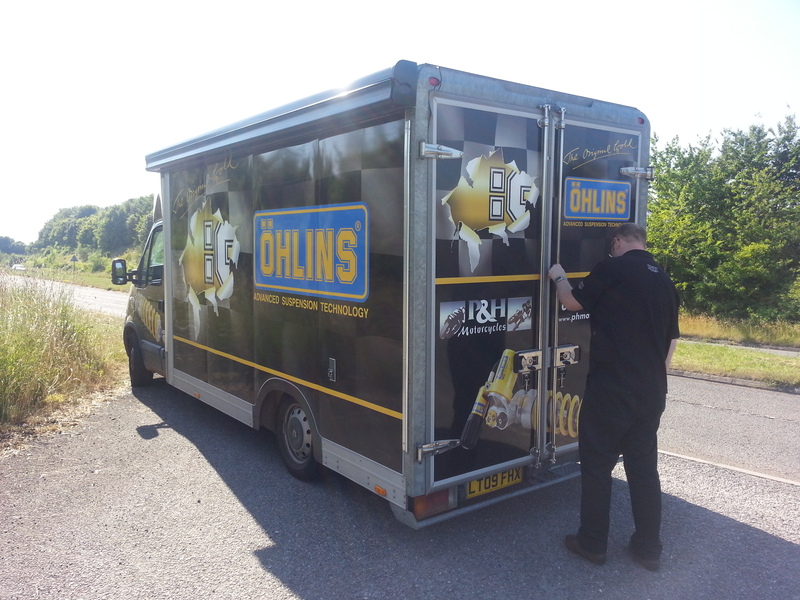 They could not do anything that evening, but the next day theyvery kindly dispatched one of their recovery vehicles all the way to Wiltshire to pick me and the bike up. I left the Red Bull KTM at the garage and then walked through the town looking for a place to spend the night before returning back to the garage the next day to get the prognosis. Despite Crawley’s magnificence and architectural splendour I decided to take the train to Brighton and find a back-packers to stay in. It was a good choice, although in the evening I joined a group of rowdy lesbians in a local pub and drank far too much Harvey’s bitter. The next day I wandered around the streets of Brighton buying junk from pound shops and eating “festival food”… whatever that is… curry I think. 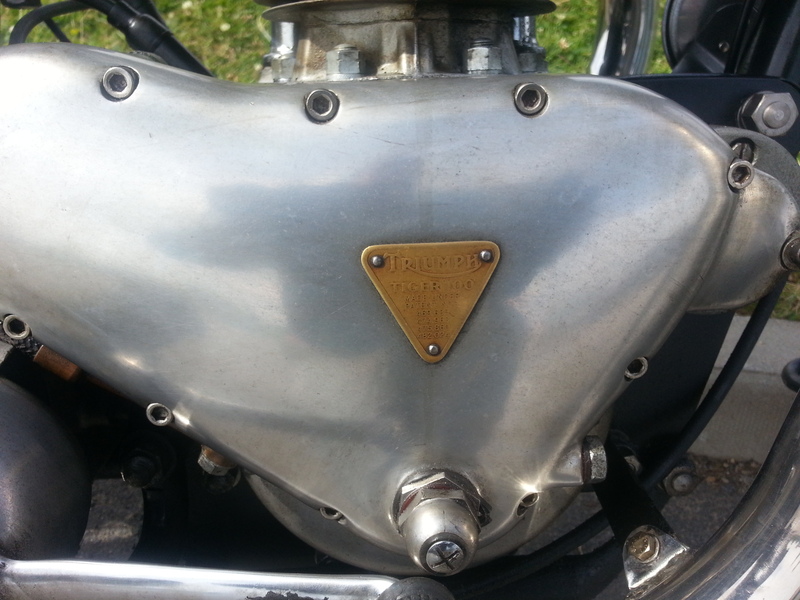 In the afternoon I took a train back to Crawley and P&H Motorcycles confirmed that the petrol pump had indeed died and it would take 3-4 days to get a new one and then a day or so to fit it. “You mean a week?” I suggested.. unable to hide my irritation. “Ummm .. maybe”, came the reply. 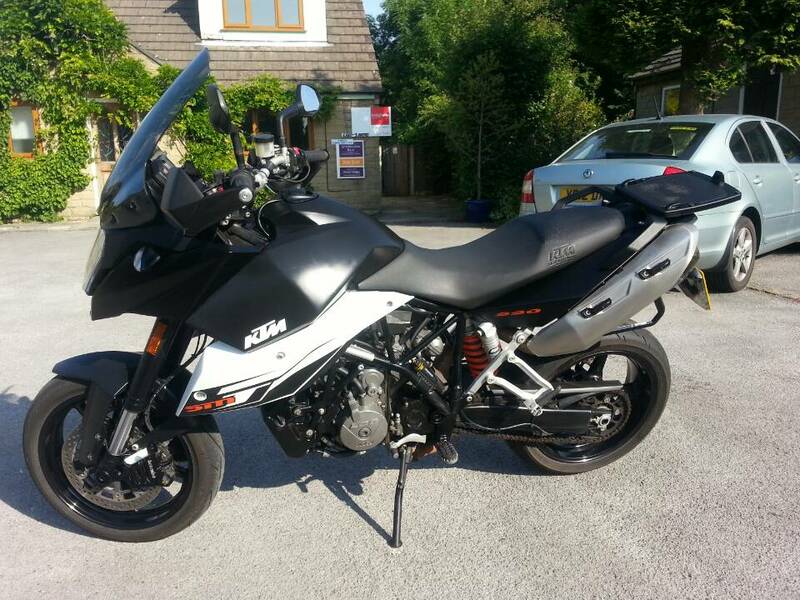 I asked if I could have a KTM courtesy bike, but was offered a very dull motorcycle to use, the sort that I don’t bother read about and skip past in bike magazines, AND I would have to return to Crawley in a weeks time to pick up the repaired (or not) KTM. Given that the plan was to tour the UK, and my time was ticking away this wasn’t an option and so I asked for my money back… which they did …as a cheque. This of course presented me with a clearing issue and I needed ready cash to buy another bike that day. But no choice, and so I went to the local HSBC bank (First Direct) and they very kindly gave me the cash without waiting for the garage’s cheque to clear… how’s that for service???? With the cash I started out with in the first place back in my pocket I then trawled the internet again and found a few bikes I liked in various parts of the country. I was quite interested in a Honda Africa Twin (pictured above) which is a classic, but not in the same league as a KTM Supermoto… and the price the garage were asking for a 10 year old bike was way too expensive for what it was. I gave it a test ride, and iconic as it is I couldn’t see me having as much fun on it as a KTM, Triumph or even a Moto Guzzi. The “find another bike” day coincided with Triumph UK’s open day and across the country every Triumph dealership was having a party and allowing test rides on all their models. My friend, Nick Dobson took me in his car to several dealerships in Sussex where we ate all their food (a very nice hog roast) and then rode a few good bikes, including the XC 800 and the 800 Tiger. I really liked the Triumph 800 Tiger and it would have been a great bike for the UK tour. The sales people seemed quite taken aback that someone actually wanted to buy a bike there and then. “Yes I want to buy a 800 Tiger….now… I have the cash in my pocket and I have insurance cover”. Sadly, there were none available. There was a Triumph Speed Triple for sale and it would have been great fun…for all of about 100 miles until my backside and joints surrendered!! 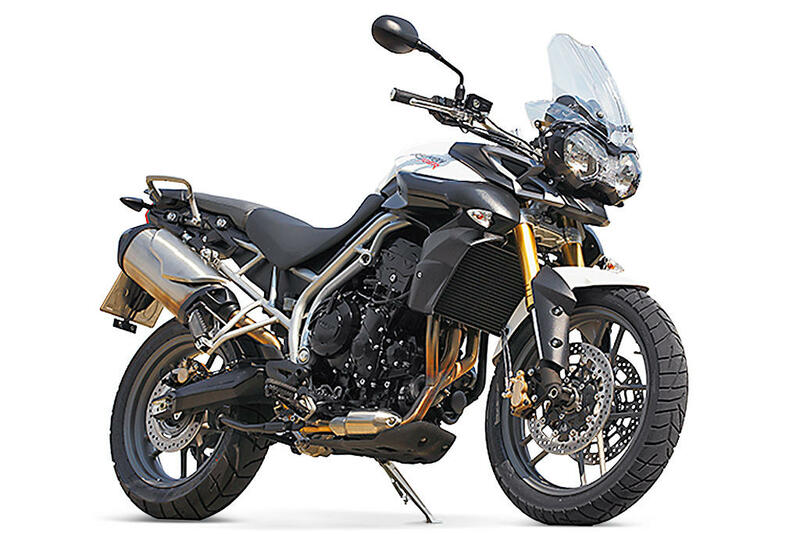 The Triumph Tiger 800… a superb all round bike with one of the best engines there is on two wheels. Sadly, none were available. I would like to have gone British, but I think I’ll carry on with Austrian. I did ring up a guy who was selling a BMW F800GS and when I asked him why he was selling it, he said he was buying a new KTM 1190 Adventure and seemed very excited about it. Quite right. My bike. One of several KTM 990 SMT advertised online that I wanted, but the private seller of this one was overseas when I arrived in the UK. 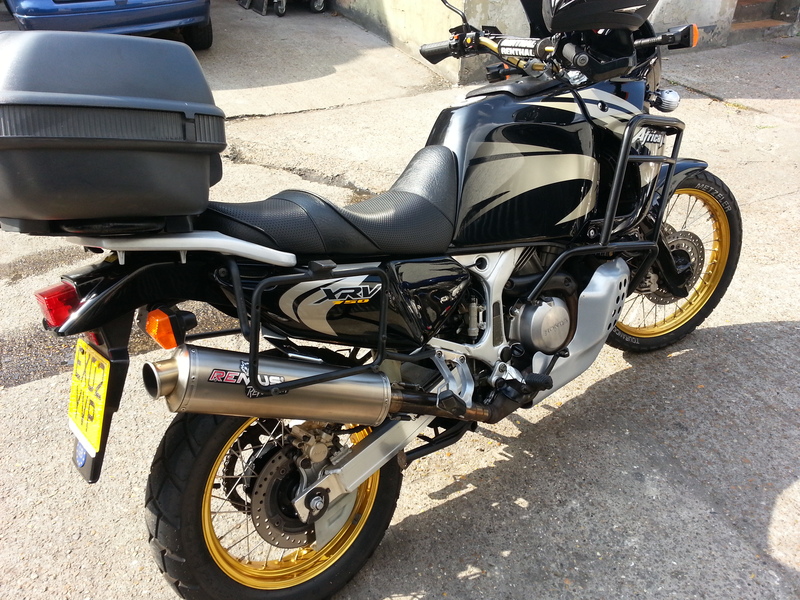 I was particularly interested in this bike because it was in excellent condition, three years old, low mileage and had lots of extras, including Akropovik exhausts that I also have on my 990 Adventure R and know really make a difference to performance of bike and exhaust note. Now that my trip was delayed this was now the object of my desire and so I went to the location that it was being sold from, the magnificent town of Slough just west of Greater London. 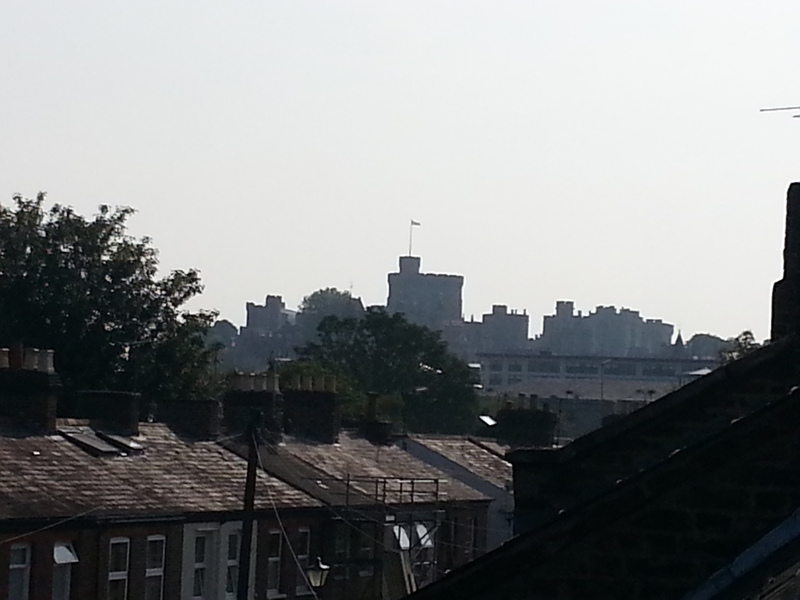 The view from my bed and breakfast in Slough was better than I was expecting it to be. I knew that most of the residents in the Slough area were recent immigrants to the UK and the Windsor family who lived in the big castle were no exception… Germans and Greeks I believe. Take Two… I bought this superb KTM 990 SMT motorcycle in grown up colours from the very accommodating and patient Jon in Slough, all the documentation was sorted, it was loaded up with my things in a North Face dufflebag, and I had a bum friendly sheep skin seat cover over an already comfortable KTM ergo seat. 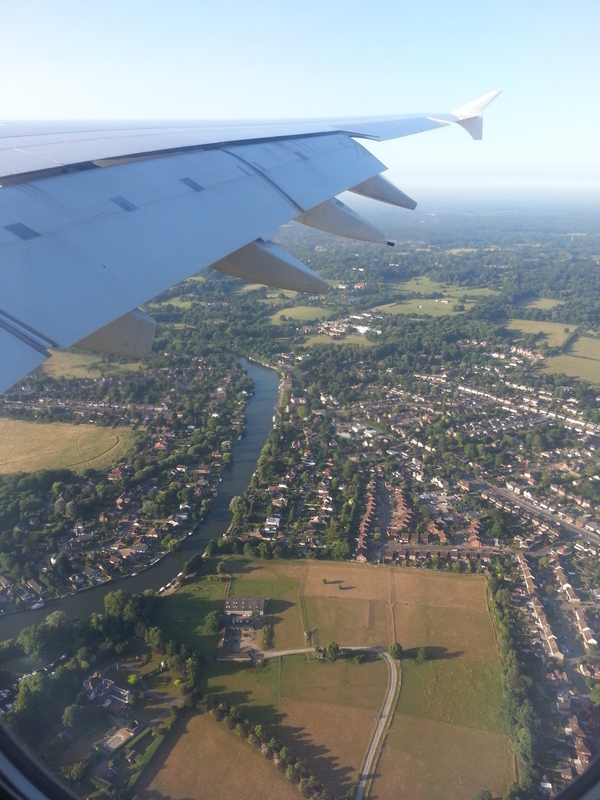 The sun was shining, the birds were singing (well when I left Slough anyway) and so I aimed west towards Wales. 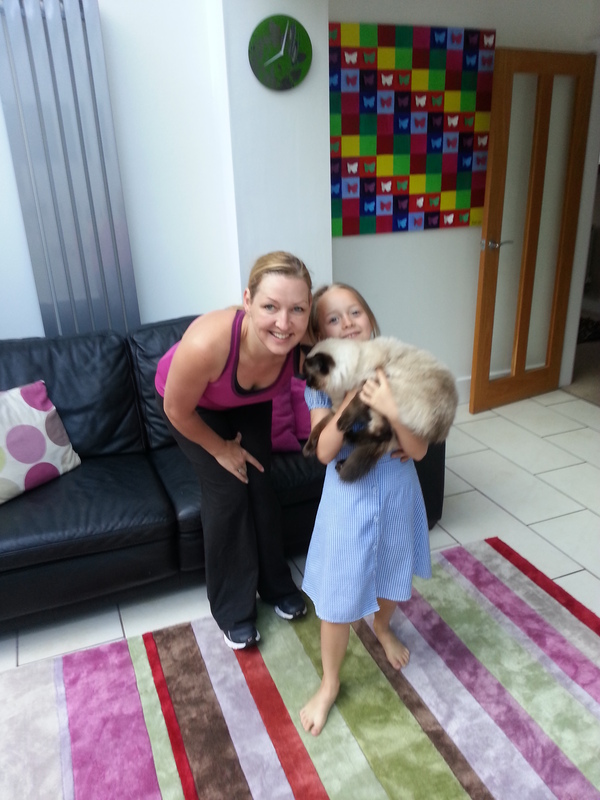 Although first I would call in to Bristol and see my daughter Becky for tea. 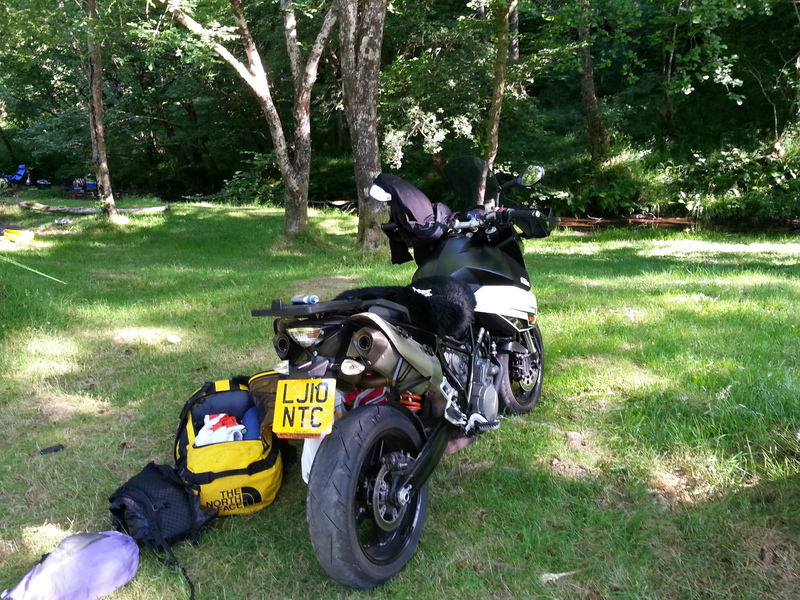 I then rode over the Severn bridge and into motorcycling heaven. Wales. The riding was glorious and I did sweeping classic “A” roads and also a fair few stretches of what should be called “Green Laning”. I tried to follow, to the extent I was able, the Offa’s Dyke route that I hiked along a year ago that separates England from Wales. As I didn’t have a GPS I relied on memory and that took me on some unsuitable single lane gravel tracks, but the bike handled marvelously all the same. It really is as capable as a sports bike and I was able to ride as fast as I dare on an R1 or Fireblade… maybe quicker. I am familiar with the v-twin LC8 from my adventure bikes, but what makes this bike so special is the ability to be ridden like a crazy sports bikes scrapping the pegs around the corners and when you want like a placid, comfortable and smooth touring bike. 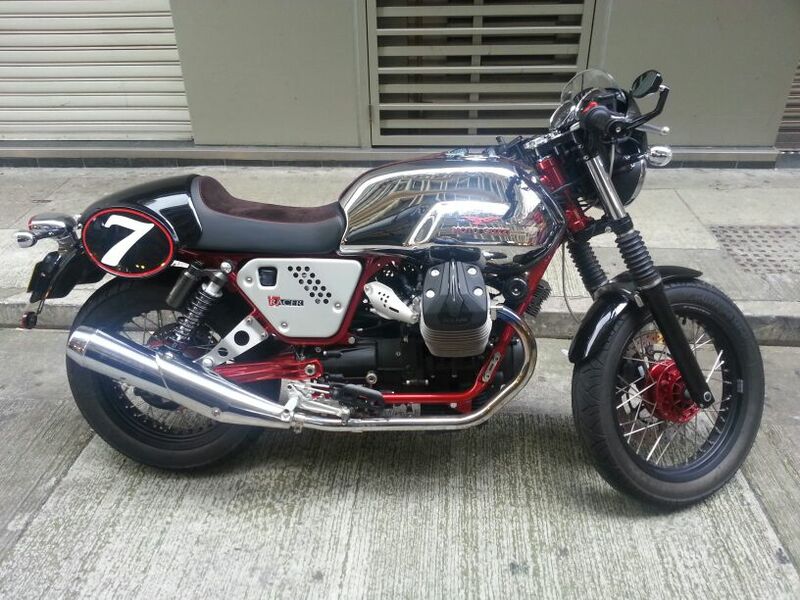 A gentleman’s hooligan bike or the other way round…. perfect. The Marchesini wheels are the same as those fitted to Ducatis and the tyres were the standard Contis that come with the bike. Sticky enough for sports bike handling and hard enough for touring endurance. 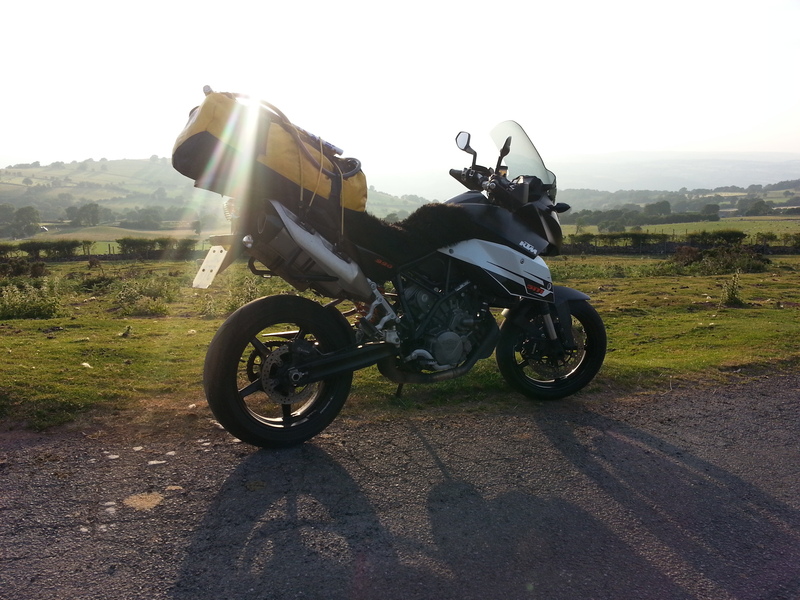 Whilst not designed like the 990 Adventures for off road and gravel, the bike is strangely familiar and easy to ride. I only had a few surprises on wet sand and mud near farm entrances when I felt the front slip slightly, but my sand riding experience and growing skill kicked in and any bike will straighten up with good throttle control and looking where you want to go. 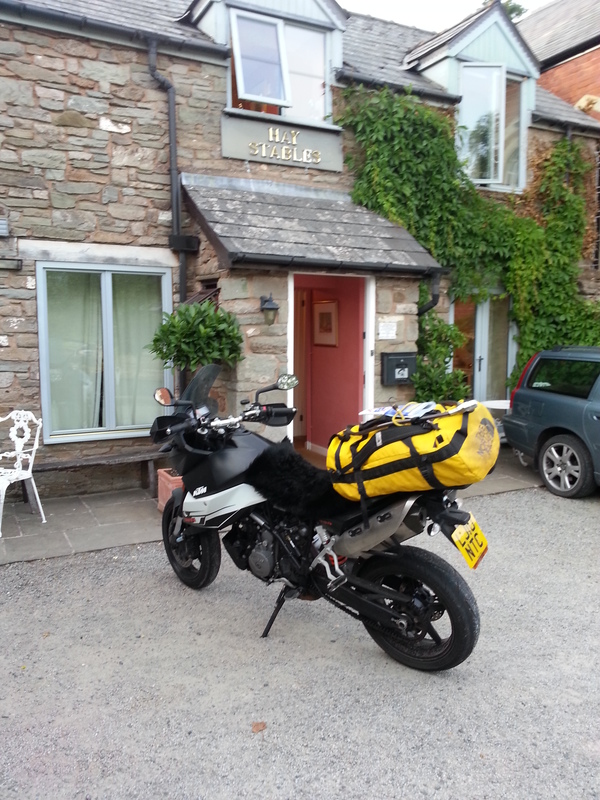 Pictured here parked up outside a very comfortable B&B that I stayed in in Hay on Wye (the UK book capital). 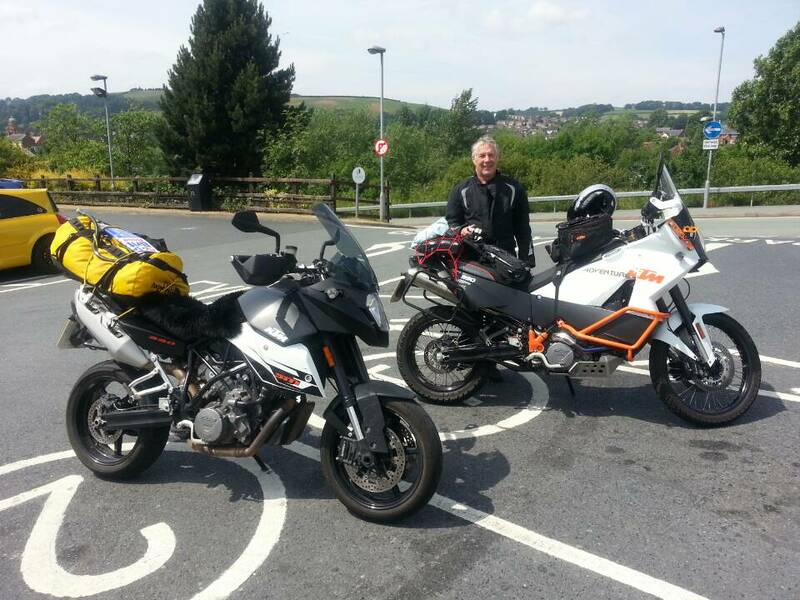 I met another KTM rider, John at a McDonalds in the middle of Wales. McDonalds across the world always has the cheapest and best coffee, you can keep an eye on your bike, and more importantly your luggage outside while you eat, you can use the restrooms to clean up, and they always have free WiFi. The only other places I (and especially Fanny) like to stop at in the UK are the layby mobile cafes for tea and a cardiac arrest breakfast. Fanny was actually online at the time I met John on the WeChat (like WhatsApp, but better) video on my phone and joining in the conversation and looking at his KTM from 8000 miles away. Modern technology, amazing huh? After coffee we had a closer look at his beautiful KTM 990 Adventure and admired all the extras that he made himself such as fog lights, brackets and GPS mounts. It looked marvelous. John was getting ready to head off on a expedition with some British soldiers to India and so I wish them luck and look forward to hearing about their adventures when they get back. Crossing the Black Mountains in Wales… There were paragliders high up above me soaring the thermals at Hay Bluff. I have also paraglided here and had walked passed this exact spot almost a year ago to the day when I hiked the length of the Offa’s Dyke from the south to the north of Wales. At that time I was in agony as my feet were torn to shreds by very badly fitting boots. This time I couldn’t be happier. There must be a moral in this story somewhere. 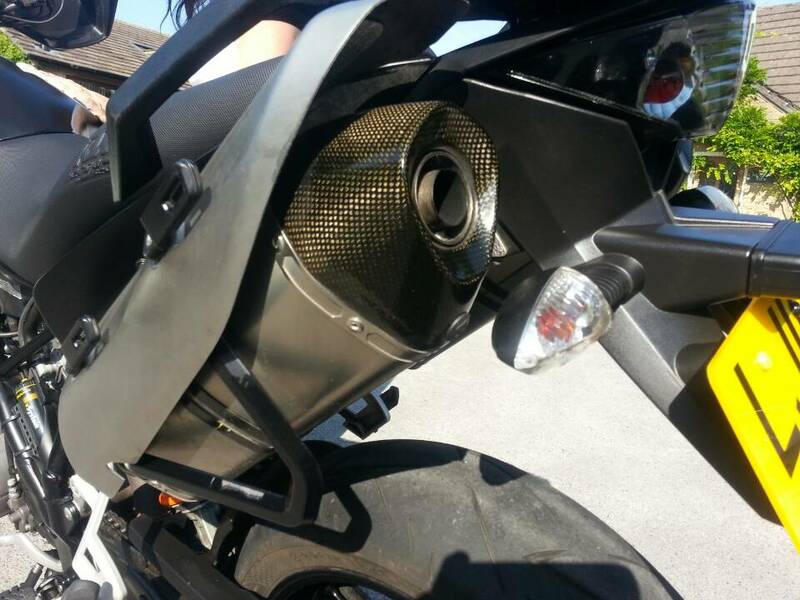 Akropovik titanium and carbon fibre exhausts fitted to my KTM 990 SMT… improves performance, looks awesome and has a glorious exhaust note. Even though I packed my old adventure kit, the weather was so warm and pleasant that I was able to ride around most of the time in summer jacket and cargo trousers. My waterproof Timberland hiking boots doubled up as excellent motorcycle boots. I had managed to buy a brand new Airoh Adventure helmet (my favourite) for a fraction of the UK price from a shop in Hong Kong and a new pair of gloves from China. After the beautiful biking roads of Wales I went to Derbyshire to ride the High Peak and the Dales. 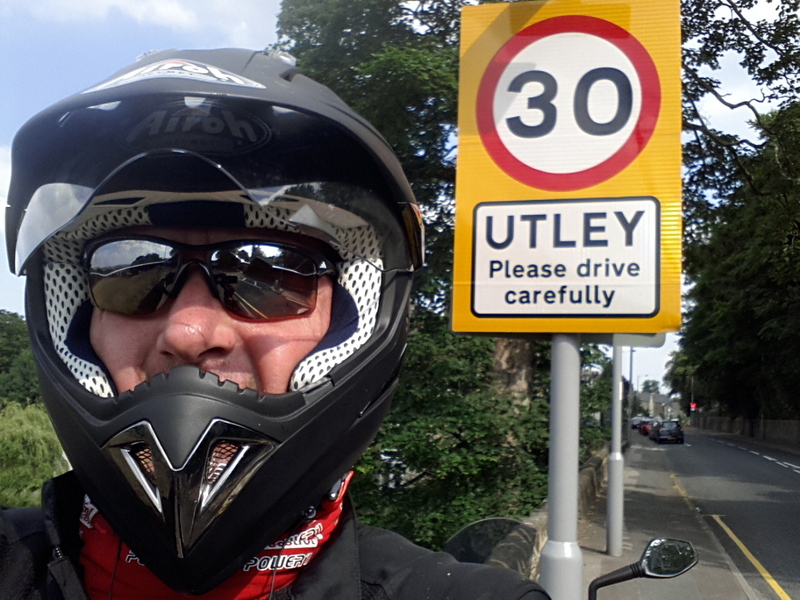 Like Wales nowadays, bikers have to be very careful as the authorities in the UK have gone mad against speeding and have a particular hatred vented towards bikers. There are speed averaging cameras on many roads and increasingly police are tasked to enforce the Road Traffic Act speeding offences .. quite clearly to bolster government coffers than protect life and property. Senior police officers like the anti hero Richard Brunstrom have quite rightly earned themselves a chapter in books like Quentin Lett’s “50 People Who Buggered Up Britain”. I agree that speed restrictions should be enforced in built up areas and high risk zones near schools and pedestrian areas etc… in fact I recommend even slower. But the practice of tricking motorists by placing speed cameras and radars in remote places and where speed restrictions suddenly change is the epitomy of mealie mouthed officialdom. I would not mind if the authorities applied the same rigour to fraudsters and crimes of violence and dishonesty … but they don’t. Bankers, politicians and lawyers steal billions from hard working people, fleece their savings and destroy their lives, but ordinarily law abiding citizens in high tech and safe vehicles get slammed daily for speeding and petty driving offences. This famous stretch of road near the Cat and Fiddle is a classic example. Completely unnecessary and ugly speed averaging cameras blight the landscape. Its a very stupid system because the equation …distance divided by time…. can easily be defeated by stopping and having a pee between the cameras and then accelerating back up to warp speed. Going for a ride with one of my oldest friends… not that I am saying Andrea is old. far from it, she is exactly the same age as me and therefore a mere whipper snapper. What I mean is we went to school together in Staffordshire back in the day. 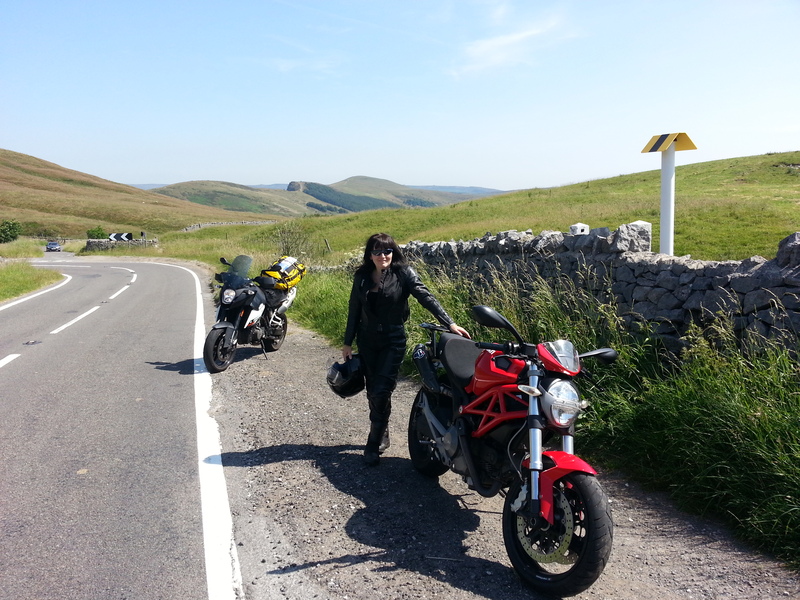 Pictured here on a sunny day near her home in Derbyshire on her Ducati Monster. Derbyshire countryside.. very lush and green. “Andrea… when you’ve finished polishing my bike I’ll have a tea …no sugar… oh and a biscuit”. What are friends for, huh? Spooky… how did they know I was coming. My goodness … an Utley Store. Surely we don’t need any more? 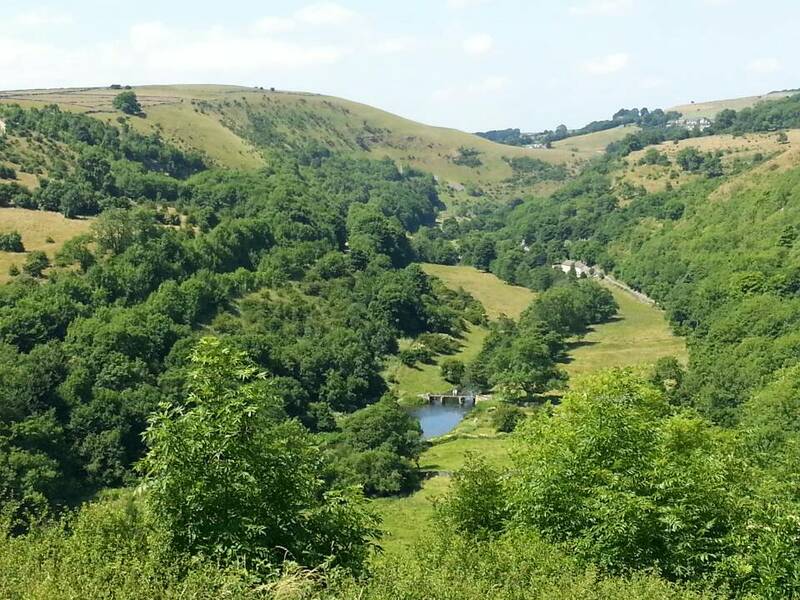 Derbyshire into Yorkshire… beautiful roads and joyous scenery. 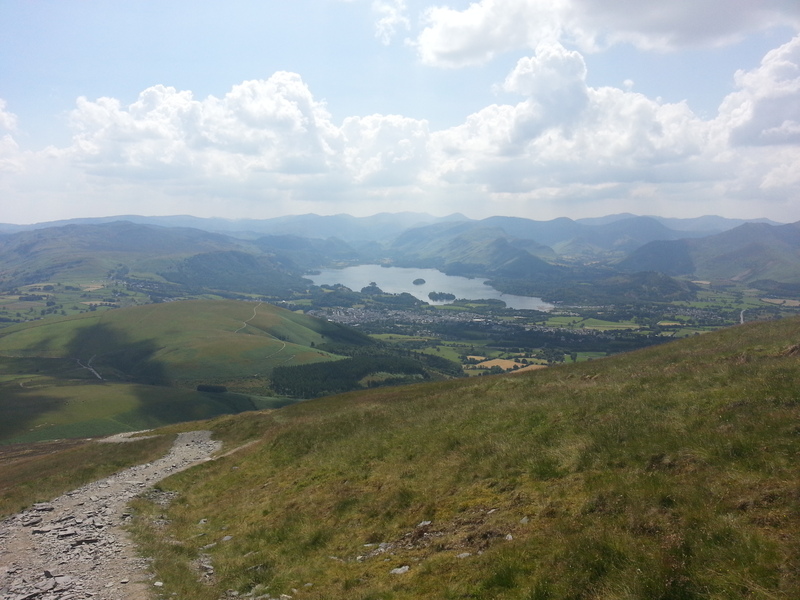 Arriving in Keswick in Cumbria, the Lake District. I borrowed a very small one man tent from my friend Andrea so I would not have to stay in B&Bs and could free camp in Scotland. Here it is pitched near one of the many lakes in the area. While I was in Keswick I bumped into one of my Royal Hong Kong Police colleagues (still serving as a Chief Superintendent) who was riding a bicycle from Land’s End in Çornwall (the most south westerly point of the British mainland) to John O’Groats in Scotland (the most n0rth easterly)… about 1000 miles. 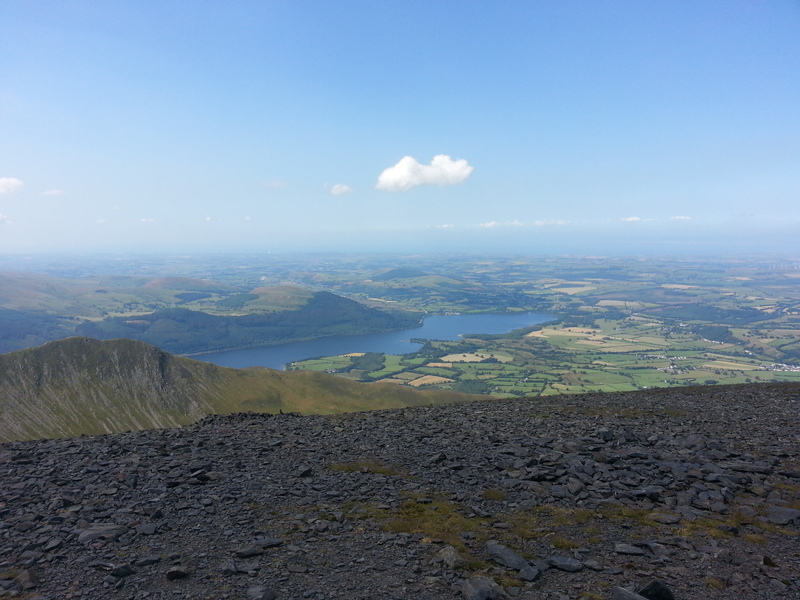 A perfect day hiking in one of the most stunning parts of England. Not high by Tibetan or even European standards, but clean, fresh, well looked after and thoroughly natural. 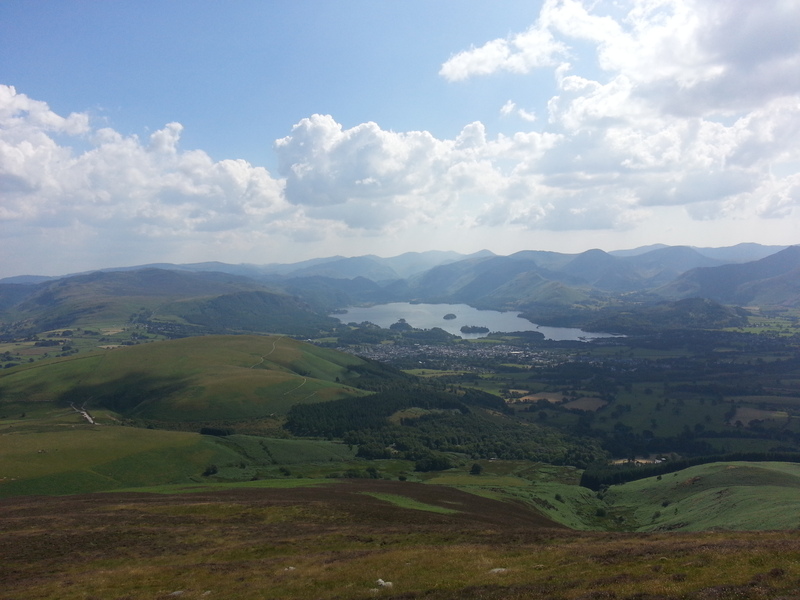 I had a picnic on the grass , did a spell of fell running and returned back into Keswick for fish and chips… Perfect. With Steve Wordsworth in Keswick, Cumbria (Lake District). Steve and I served together in the Royal Hong Kong police (he still does) and he was riding his bicycle from Land’s End to John O’Groats…. which he completed successfully a week later. 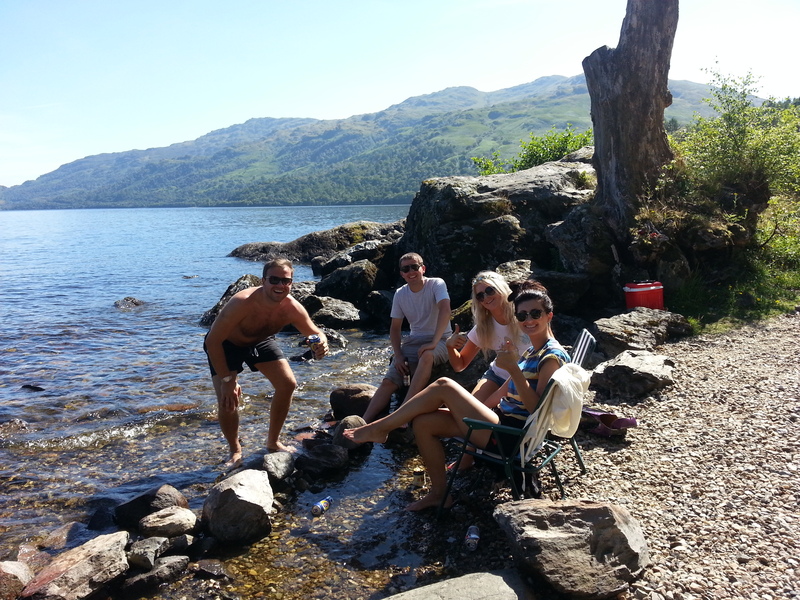 Sun, warm water, and pretty girls… yes it really is Scotland. Now we are talking. The ride now moves up to a new quantum level of beautifulness. Fanny and I have ridden around the world and been privileged to see and ride through the Himalayas, Pyrenees, Alps, Dolomites, Guilin karst mountains, the Rift Valley, Kilimanjaro, the Serengeti, Masai Mara, Ethiopian Highlands, Qinghai plateau, South Africa’s Cederberg, the Atlas mountains etc etc… but West Scotland on a good day is second to none. 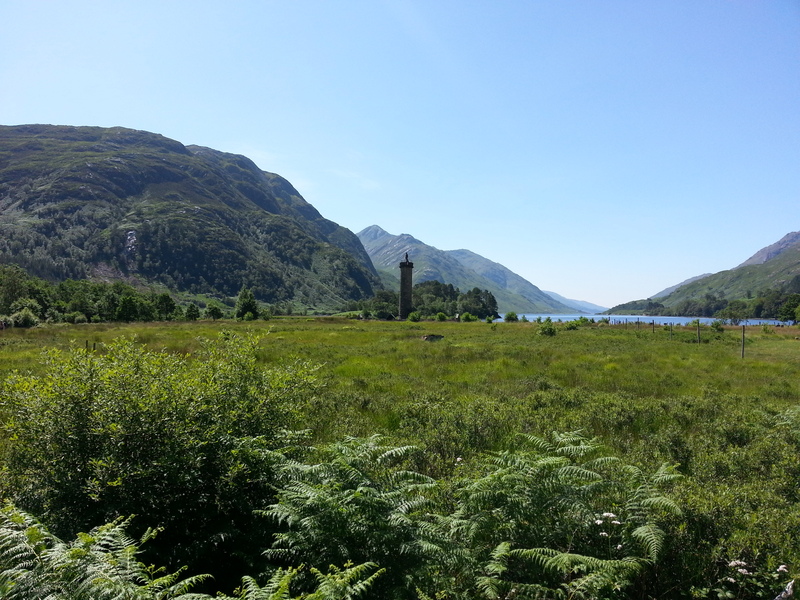 Glen Coe…. the area where the movie, “Skyfall” was filmed. Bobby and Willie (Yamaha XT 600 and BMW K1000) who took me for a very civilized (i.e. 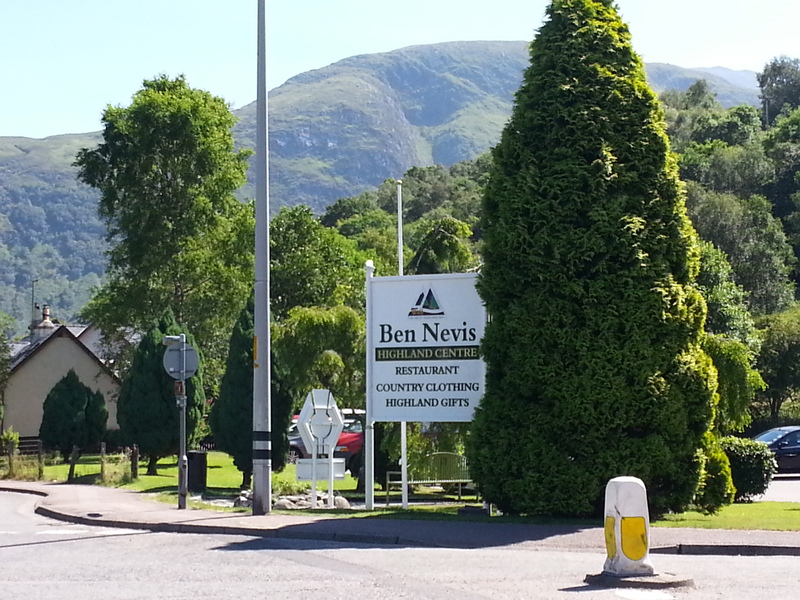 slow) ride around the Ben Nevis area. 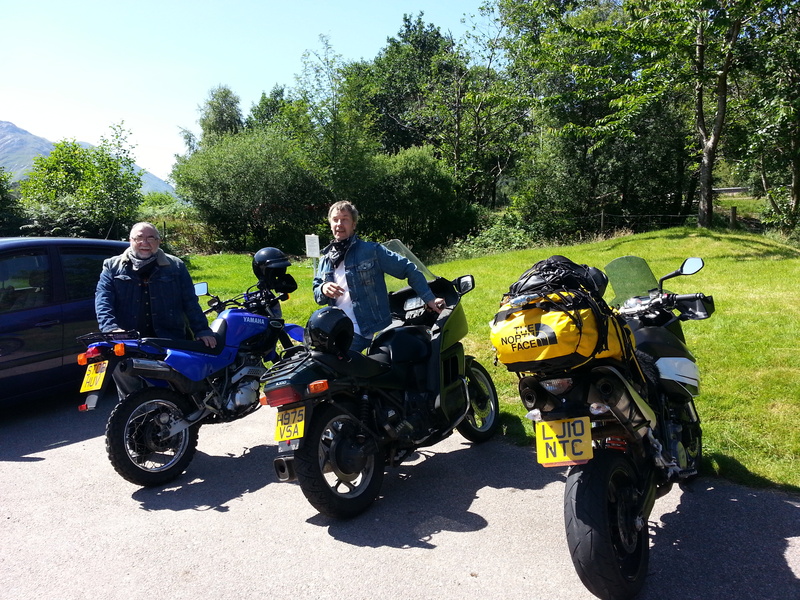 Saying goodbye to my new friends, Bobby and Willie with whom I rode around western Scotland and had a great day. 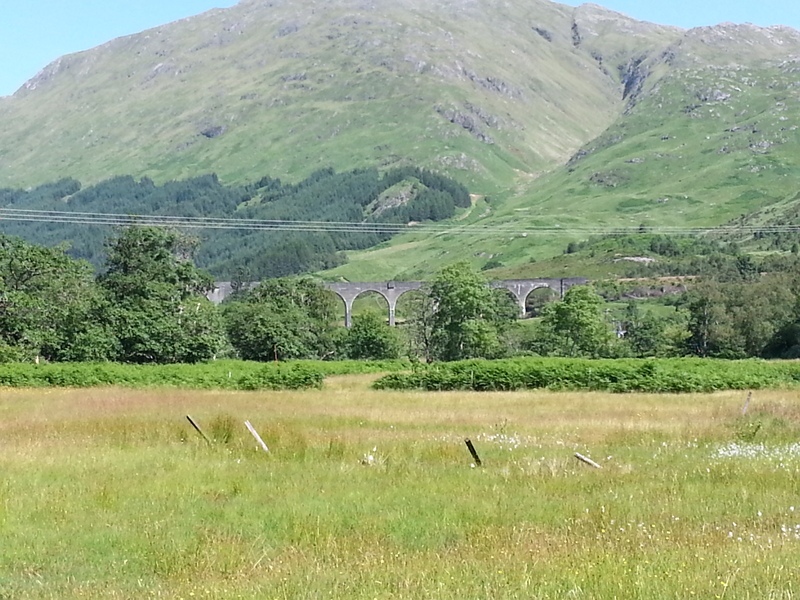 Riding through the Highlands in beautiful sunshine… this bit reminded me very much of Tibet. I rode up the twisty road at some pace and was surprised to be overtaken by a Swiss registered sports bike with a rider in full race leathers. 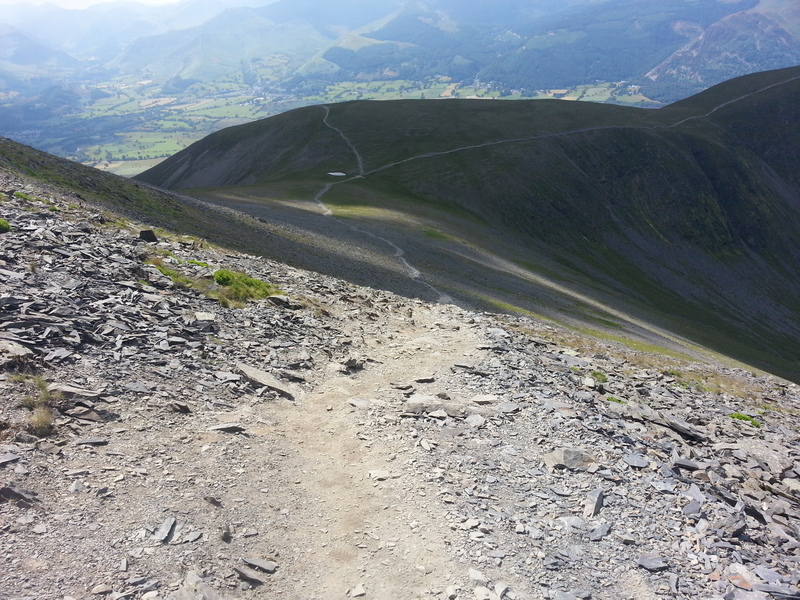 When I got to the top I saw it was a BMW S1000RR…. OK… fair enough. 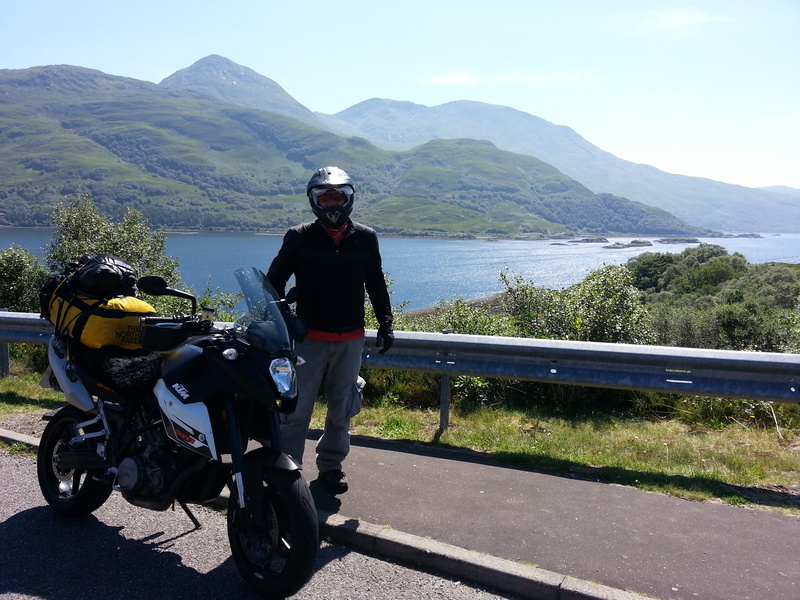 Taking ferry over to the Isle of Skye with the other bikers. This biker from Durham, who lives on Skye introduced to me and gave me a jar of Avon skin softening cream that all the locals use to ward off the scary Scottish midges….Despite being an odd substance for a hairy biker to rub over his skin it really does work … and added a fresh fragrance to my normal smell of sweat and petrol. Many thanks. 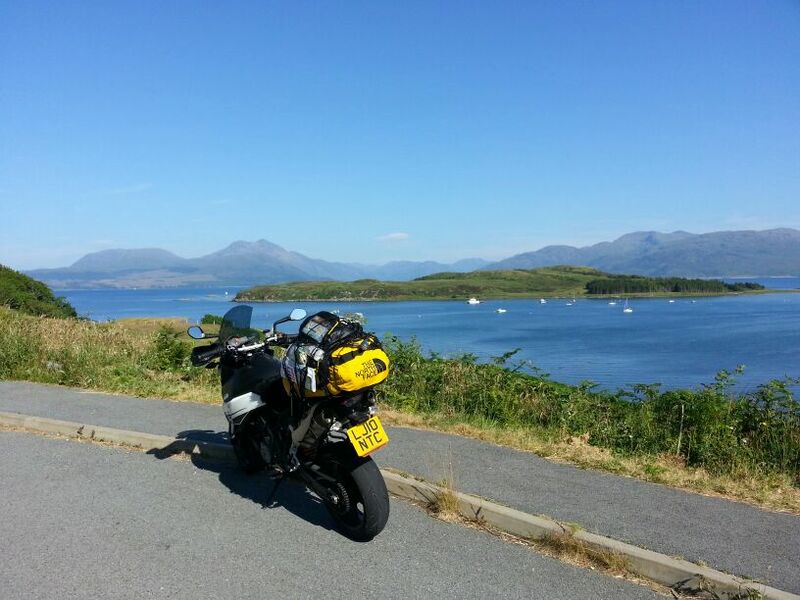 Ferry to the Isle of Skye with the other bikers. 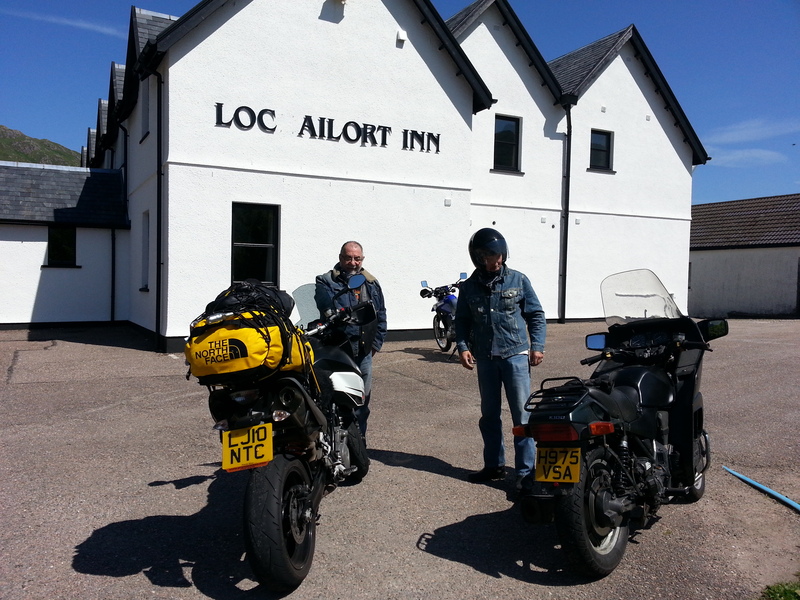 It seemed with the good weather a lot of international bikers (the Moto Guzzi belonged to a French couple) were touring Scotland. That said as I went further north I saw fewer and fewer people. 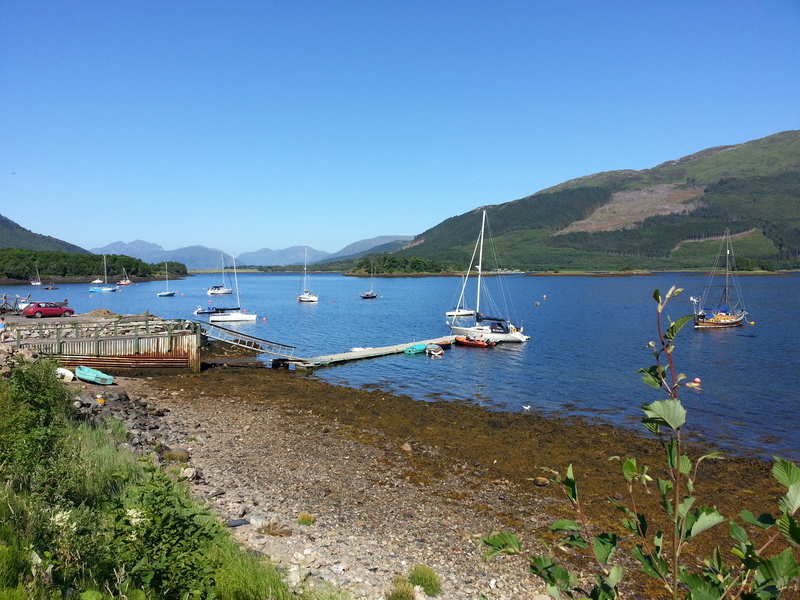 Pretty Scottish villages along the west coast. An incredibly beautiful part of the world. 300 Scottish malts at a pub on Skye… now where do you start? Well, from the beginning is a good place … hick!!! 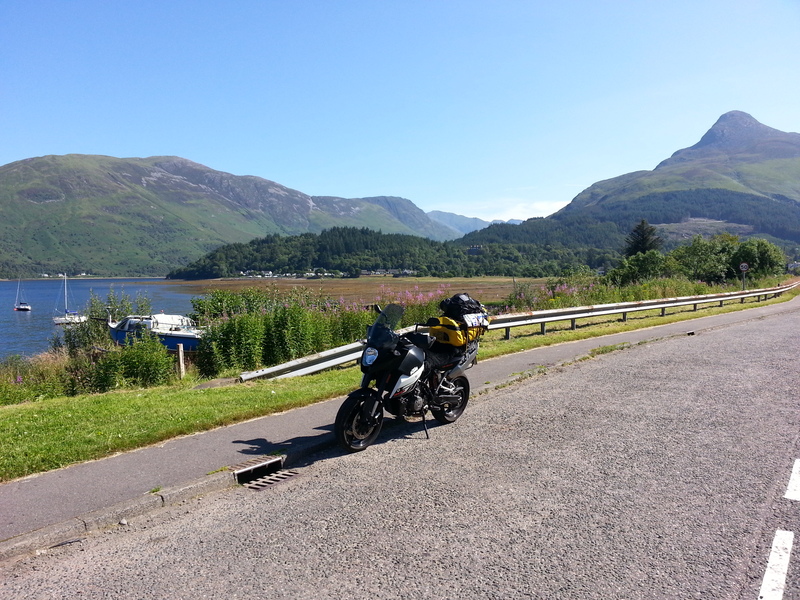 I rode many miles zigzagging along the sea coast and along the many lochs of west Scotland. Passing through picturesque villages and pretty towns all the way through the Highlands and to the remote north west point at Cape Wrath. I must say it was some of the best riding I have ever experienced. 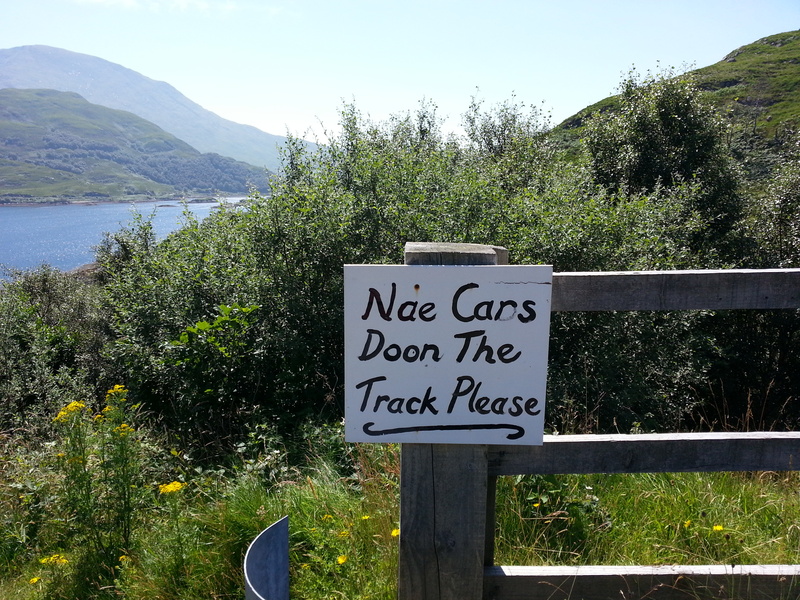 Very friendly and welcoming people and none of the English/Scottish rivalry we all come to expect. As difficult as it is to explain, Scotland actually seemed more “British” than England does. In parts looking like Tibet and other times like Ethiopia. I am a big fan although I will still be supporting Ingeerland in the footie… someone has to. Palm trees in Scotland! Due to the Gulf Stream that courses up from the tropics to the west of the British Isles some parts of northern Scotland are far milder than one would expect given its proximity to the Arctic Circle. It is, however, safe to say that the weather isn’t always as glorious as when I was there and can often be decidedly wet and blowy. The flower of Scotland….always reminds me of going on holiday to the Island of Luing off the west coast of Scotland near Oban with my best friend and his family when I was a small boy. Whilst playing near a small cliff with a sheer drop down to the sea some local bully boys approached us and threatened to throw us into the sea if we didn’t sing “Oh Flower O’ Scotland”. After about 10 seconds of making up a song about some thistles we gave up and just jumped off the cliff in the sea below. After we surfaced and were bobbing about in the waves we cheerily told the local lads who were now high up above us what we thought of their flowers, accompanied by some hand gestures that were popular with naughty boys during the early 70s. Oh happy days… !!! Its gets even more like Tibet … mountains, valleys, lakes and big hairy things with horns in the road. 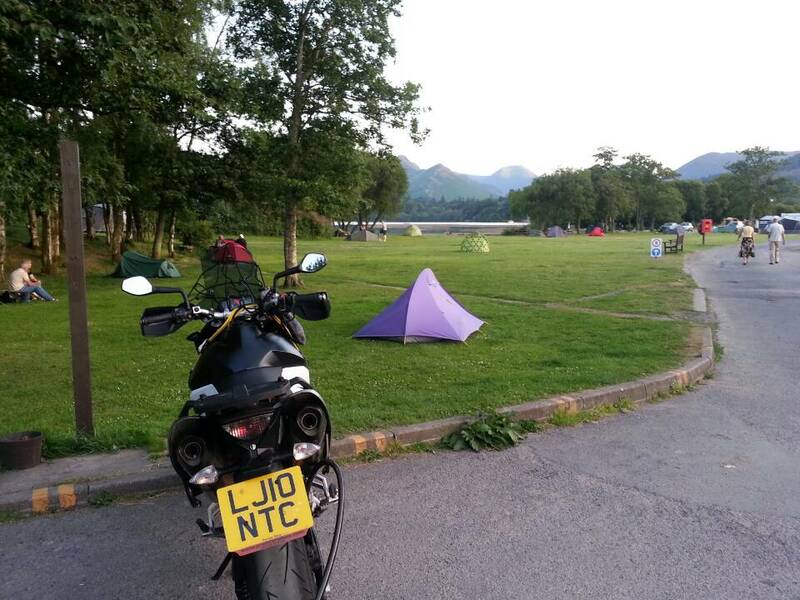 Fellow bikers from Canada… They had a BMW F800GS with all the accessories, great tent and excellent camping gear. Their navigation and photographic equipment was particularly impressive. There is always something to learn and admire from fellow adventurers. Whilst chatting with them they suddenly got very excited and burst out, “Hey…you are the couple riding around the world… we read about you on ADV Rider…. where’s Fanny?” (scanning left and right eagerly). I explained that she had to work and wasn’t with me. Absolute silence. They could hardly disguise their disappointment and turned around and sauntered back to their tent with their heads hung low and banged in a few more tent pegs. 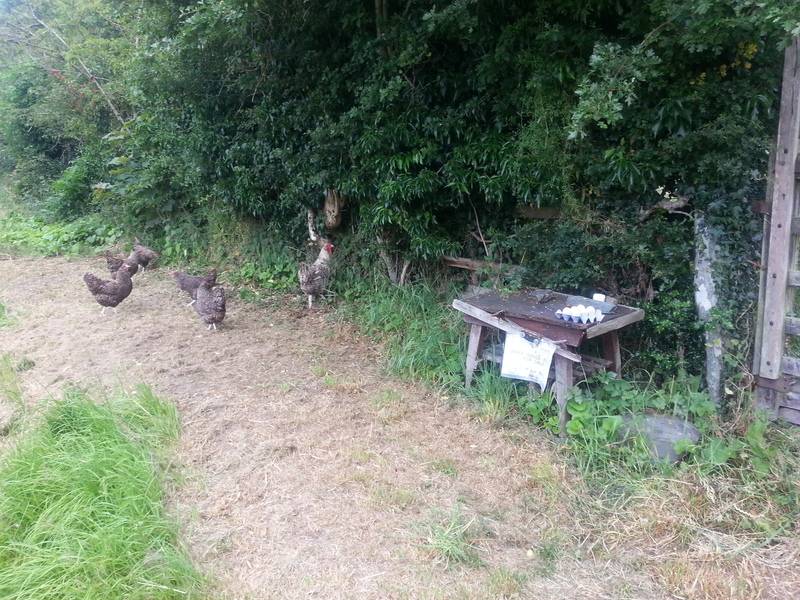 Now I know what Charlie Boorman feels like… “I’ll see you in the pub later shall I?”, I shouted over to them, but they mumbled something in French and didn’t look up. I thought of shouting back … can Fanny do a one handed wheelie in the sand? Noooo. But I didn’t .. petulance is an unattractive trait in a human being … even if I can ride better than her… so there. I am still not entirely sure what these German tourists with a safari tent on top of their Land Rover were expecting to see or encounter in the Highlands of Scotland… a ferocious otter or a terrifying haggis. Anyway, they were well prepared. Perhaps the fearsome Loch Ness sheep? 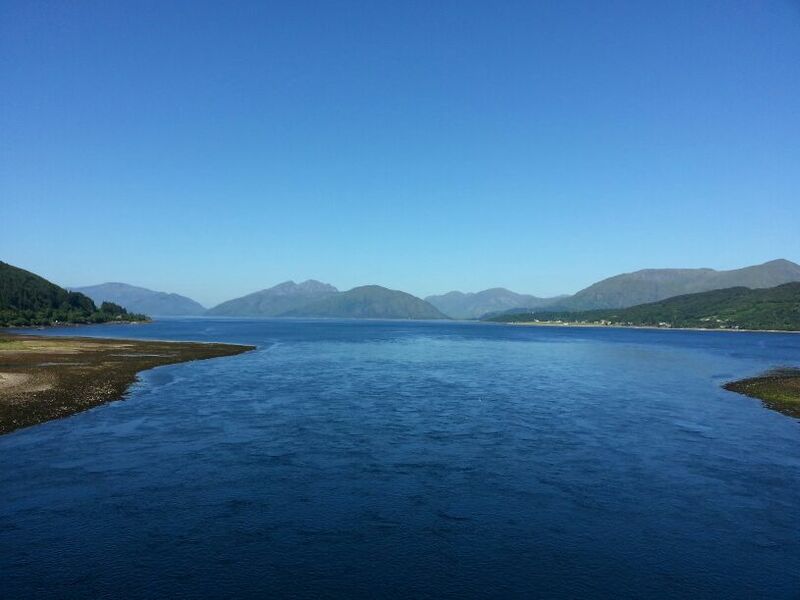 A ferry to Skye and a bridge back to the mainland. Some people told me they had seen some killer whales (Orca) further up the coast… but I never saw them. Riding along the single track roads required more attention to the road and hedgerows than staring out to sea. I challenge any biker to show me a better stretch of road. Zero traffic, twisty road, perfect temperature, and glorious scenery. In Scotland there are no trespass laws and so provided you respect the countryside and the property of others you can camp where you like. Here I am camped at the most north west part of Scotland, enjoying the fresh air and sea views in complete peace. Earlier I went to a nearby pub for a seafood dinner and a pint of Scottish ale and listened to a folk band. Being so far north in summer it did not get dark until after 11pm. I will definitely have to bring Fanny and my children one day. 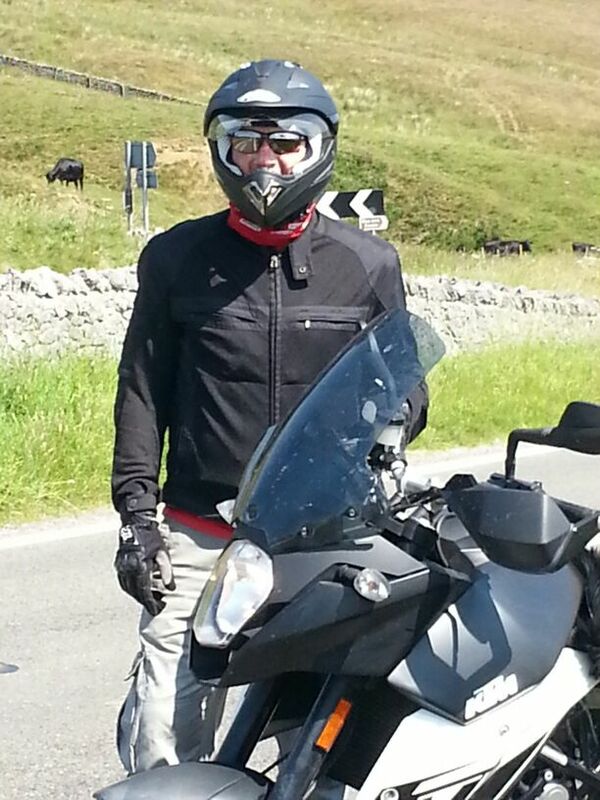 I then rode along the north coast of Scotland to the most northerly part of mainland Britain, John O’Groats. Funnily enough the rock structure looks like those at Cape Aguilas on the most southerly tip of Africa where Fanny and I started our Big Bike Trip expedition in 2011. 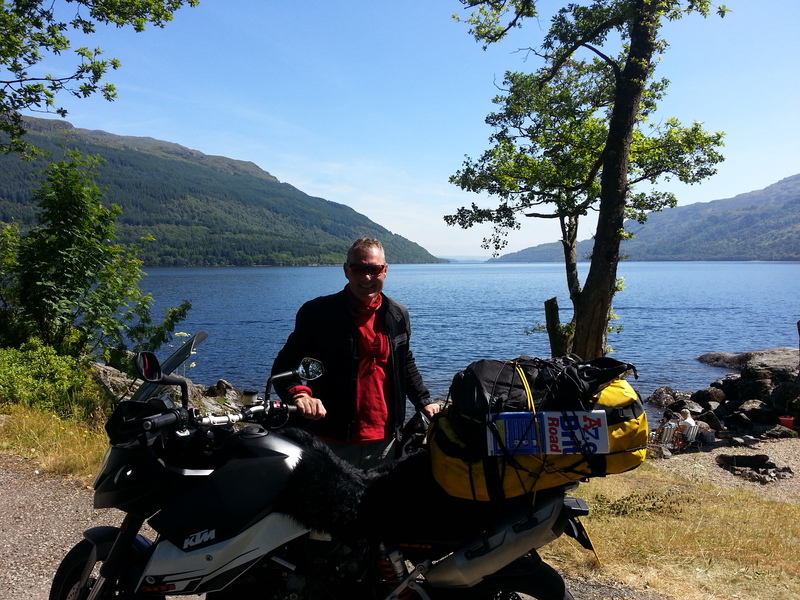 After a brew and a Scottish cake I then turned south and rode down the east coast of Scotland towards Inverness, rode along Loch Ness and then headed in the general direction of Edinburgh, passing through dozens of beautiful towns and villages and across glorious mountain roads. I continued riding through Scotland to the border with England and crossed over Hadrian’s Wall into majestic Northumbria where the accent abruptly changed from Scottish to Geordie. Whilst I was there I heard the news about an ill informed and rather gormless British MP who suggested that shale oil mining using the controversial “fracking” method should be conducted in the north east of England because its barren and nobody lives there. Having ridden across this lovely part of England and met some wonderful people in Newcastle, Durham, Middleborough etc…and at the Wagon Inn in Westgate on the A696 I can refute this. Who votes for these idiots? Anyway, this picture was taken after I arrived at the Wagon Inn and asked if they knew where I could pitch my tent. “In our beer garden”, of course” came the reply from the friendly landlord. Fantastic. 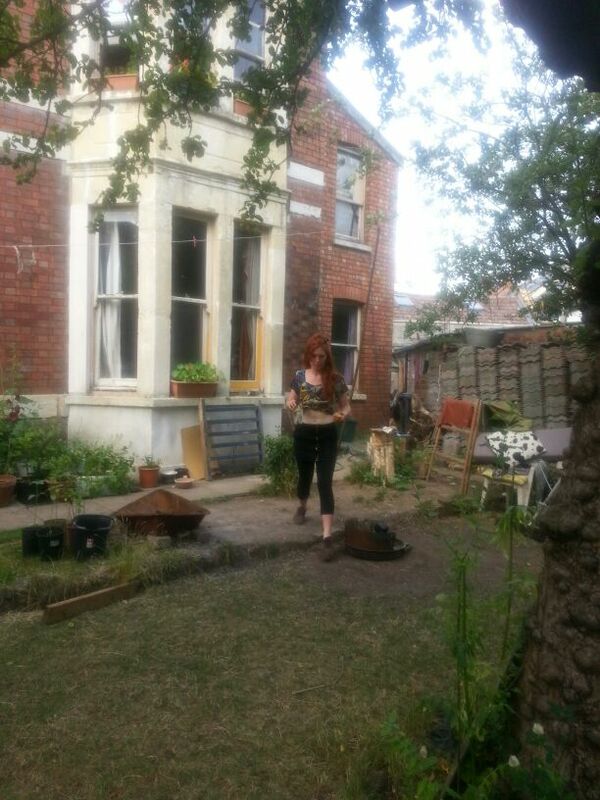 So after some beers I retired (staggered) to my garden retreat. Has to be done …. a road side fry up (on the road between York and Harrogate). I wanted to see the Viking museum in York and then go to Betty’s in Harrogate for tea and a teacake. So I did. Harrogate … outside the famous Spa… or is it a Chinese restaurant… ? I continued all the way through Northumbria, the Yorkshire moors, back to Derbyshire High Peak where I did some hiking on Scarfell Pike. I then continued on to Staffordshire to see my mother in Abbots Bromley where I grew up, then back south through the Black Country to Tewkesbury where the local KTM garage replaced the mirror I smashed in John O’Groats (bike fell over on soft ground while I was having a cuppa), then through the beautiful Coltswolds and to Salisbury Plain in Wiltshire where I stayed with my sister. The next day I continued to the South Coast of England through the New Forest and to the fascinating town of Old Hastings where I stayed in a superb Inn called the Jenny Lind (highly recommended). The next day a short ride to Bexhill on Sea (bike pictured outside the interesting art deco De Warr building) and got the bike MOT’d as it was just about to reach its 3rd birthday. It passed after a 1 pound reflective button was put on the number plate… Next stop… Hong Kong. No trains either…….. A bit of drama on the way to the airport as the train from Bexhill to Gatwick just stopped and never moved again. The dozens of staff belonging to ” Southern Rail” in these daft t-shirts wandered about like headless chickens panicking, or lurked out of sight in cafes to hide from irate passengers. Wouldn’t happen if I was in charge. Investigate what happened, evaluate best options and then clearly communicate plan to staff and passengers. How hard can it be? Anyway, a big thanks to my friend Nick Dobson for rescuing me from Eastbourne train station and ferrying me to Heathrow Airport just in time to catch my flight back to Hong Kong. 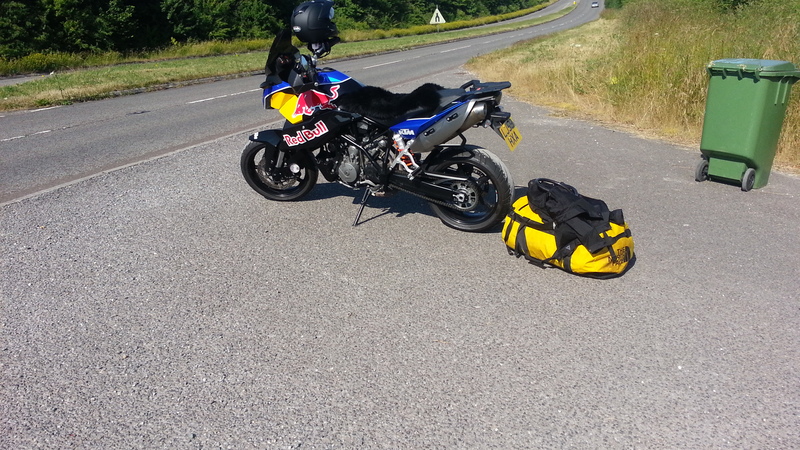 This entry was posted in Animals, Equipment, Europe, Fanny, KTM, Places, Route, Rupert. 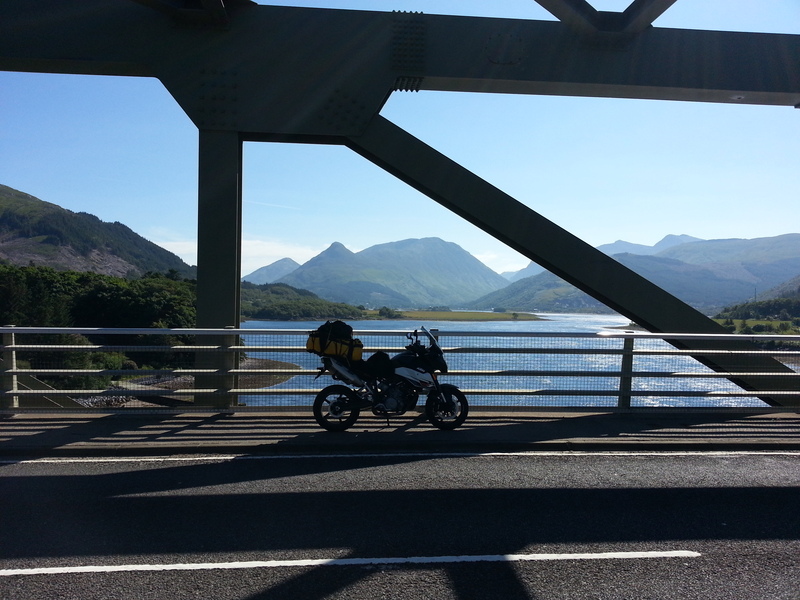 Tagged Africa Twin, Battle, Ben Nevis, Bexhill, Black Mountains, Britain, de Warr, Derbyshire, Durness, Edinburgh, England, Fanny, Glen Coe, Glenfinnan, GPS, Green Lane, GS800, Hadrian's Wall, haggis, Hastings, Hay on Wye, Highlands, Hong Kong, Inverness, Isle of Skye, John O'Groats, Keswick, KTM, Lake District, Lantau Island, London, M4, Malt, Mui Wo, North Face, P&H Motorcycles, Red Bull, Rupert, Scotland, Skyfall, SMT, sped camera, Summer of 2013, Supermoto, Tewkesbury, Tibet, Touring, Triumph, UK, United Kingdom, Wales, Whiskey, Wimbledon, yak, Yorkshire. Hi rupert , we were the guys you met camping by Loch Lomond , was great to see the pictures up and the girls were impressed by your comment ha. Just a pity we didn’t get to meet fanny. Hope the rest of your amazing trip goes safely . I am really glad I came accross your blogs… they are really good reading and inspirational..
Netheravon – memories of my parachuting days at the JSPC there. I must have bought that Red Bull KTM after you returned it. P&H didn’t tell me about the problem you had when they sold it to me. I rode it home and after a couple of days later the bike just stalled during a ride. It took me a while but I worked out that the culprit was the fuel level sensor was not working i.e. i ran out of gas without the reserve light coming on. On top of that the fueling that bike was horrible. After reading up on the internet I updated the engine map with a more appropriate one. Long story short you were luck you didn’t hang on to the bike. It wasn’t a particularly good example. It’s fair to say the fancy pain job was a distraction. Oh! And that vinyl started bubbling really badly a month after I bought it.